*Early morning practices require something special on a Friday. Last minute “please, Mamma requests” are my favorite to complete, no matter how old they get. Their smiles are worth baking before sunrise. This entry was posted in Recent Posts and tagged baking, Children, Chocolate Chip Muffins, Early Morning, Haiku, Homemade, Love, motherhood, My Life, Photography, Poetry, Relationships, Teenagers. Bookmark the permalink. A great mom. Wishing you and the munchkins a beautiful, merry Christmas, Audrey. I know I know, as long as they’re happy, we are. But I hope you have your own happy, too. Thanks for the visit, D. Merry Christmas to you and yours. You are such a good mamma, Audrey. When they’re older, they’ll remind you how much they loved the muffins. 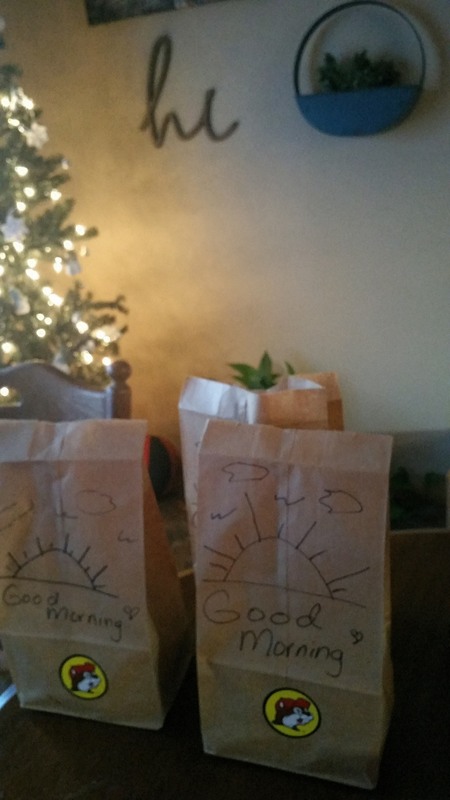 And I love the notes you wrote on the bags. amazing lesson and deeply beautiful!! Aw, you’re such a good mama! This sort of thing is exactly what kids need — being sent off into the world covered by homemade love and prayer. Well done, ma’am! Did ya haf’ta do the stickers? Aww Mom……. I kinda did… Mom’s domain. I bet they were the cause of smiles. Killer with a Buckee sticker too. Ha. Gotta use a Buckee sticker when I can. Used to be a fun place to stop into during our week.